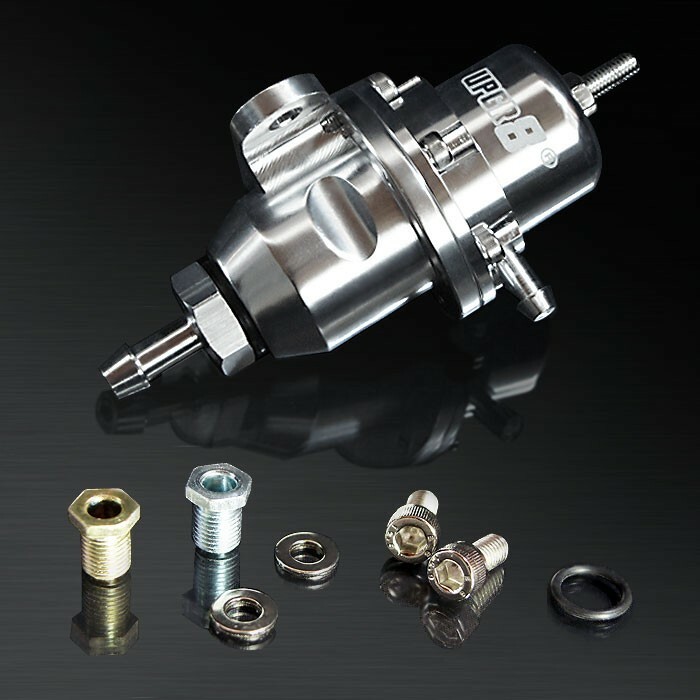 UPGR8 adjustable regulator is manufactured from CNC T6061aluminum. It is unique in that the discharge port is changeable, letting you tailor the regulator return volume to match the fuel pump. This UPGR8 fuel pressure regulator direct bolts on the stock Honda or the aftermarket high volume fuel rail. Because it is tapped to 9/16- 9/18 threads, the fuel outlet port allows various different hoses ranging from stock Honda fuel return hose to -8 AN hose. The vacuum reference is at a 1 : 1 ratio. For every pound of boost on turbocharged or supercharged application results in a 1-pound rise in fuel pressure. You can adjust from a range of 30 PSI to the maximum the fuel pump can deliver.